We at Customhousecardigan.com endeavour to provide customer satisfaction. 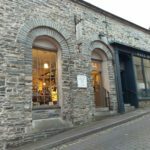 If you need to reach us, please email us on info@customhousecardigan.com, or you can phone (+44) 01239 615541 You can write to us at Custom House, 44 St Mary’s Street, Cardigan, Ceredigion West Wales. SA43 1HA. We deliver your order as soon as it’s ready for despatch. We will normally send your order to you within 14 business days or, as many of our items are individually hand made and it may from time to time require us to call the customer to state a specific delivery time. We regret that we are unable to ship outside the UK online at the moment. But please feel free to call the shop or email us and we can see if we can get a price for individual international/Global shipment of goods. Customhousecardigan.com do not disclose buyers information to third parties. Cookies are used on this shopping site, but only to keep track of the contents of your shopping cart once you have selected an item. We know of no documented cases of credit card fraud using Woocommerce and Paypal over the Internet. All credit card numbers are encrypted in the software when the order is placed using 256bit encryption. We do not see or store any credit card numbers on file. Customhousecardigan.com endeavour to provide customer satisfaction. To achieve this we offer a return policy as stated below. We do not allow order cancellations. We only accept returned goods if the damage is obviously due to a delivery or manufacturing fault. We state that all returns must be sent via registered post, courier or via a guaranteed delivery method. All items must be insured by the return delivery method used and all insurances must fully cover the total value of the items returned. Customhousecardigan.com is in no event responsible for return item losses. Returned items must be new and unused and in unworn condition. There must be no mark or blemish on the return item, there must be no sign of wear and tear on the product. The tag, case or packaging must remain intact and unopened. We cannot return an item with any indication that the item has been used or altered. In addition, returned items must be sent with their initial documentation. All items properly returned via the methods stated above are eligible for a credit card refund, store credit note or gift voucher. Making a purchase could not be easier. Just browse our online shop, and click on any items that you wish to buy and put them into the shopping cart. After you have finished your selection, click on “Proceed to Checkout” and you will be asked for a few details which we need to be able to satisfy the order. At present we are only selling online to customers based in the U.K. but you can call the shop (01239 615 541) or contact us and we can get a delivery price and time to other European and Worldwide destinations. Our gift tokens are valid for 18 months and can only be redeemed at the Custom House Cardigan shop at present. We accept credit/debit card payments. We accept Visa, Mastercard, American Express, Delta, Solo, Switch and PayPal.